Carefree Gold Coast Deluxe Screen Room 14 ft. 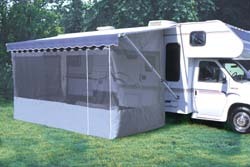 These RV Screen Rooms are lightweight, easy to set up, and expand to fit your awning with no drilling required! Expand-A-Panel sections lengthen your Open Air Screen Room to fit all popular awning widths. Tough, breathable ArmorWeave screen keeps pesky "no-see-um" insect out! Spring loaded support rafters ensure a snug fit. Panels are held to the coach with flexible plastic Clear-Locs which adhere to your RV’s side with industrial strength adhesive. Includes everything to make set up quick and easy including grommets, tent spikes, support rafters and a convenient, lightweight zippered storage bag. Fits high or low profile RVs.